This article was written by Basketball HQ co-founder Kyle Ohman. Coach Ohman is a skill development trainer, high school basketball coach, and camp director/instructor all around the world. Kyle also has a background in playing as well. He was a 1,000 point scorer at Liberty University and was ranked the 19th best shooter in the country his senior year by Fox Sports. After college he played professionally in Europe. One of the words that can be closely associated with a great shooter is efficiency. There are a lot of shooters out there that average a lot of points, but they are also averaging a lot of shots as well. These types of players are"volume shooters" and it is rare that they are associated with winning teams. Great shooters are able to take and make shots at a high percentage; which helps their team win games. They recognize that this is their "role" on the team, and they do their best to help the team win. As you can see from this list, a great shooter is comprised of many different things. There are good shooters that check off some of these points, but only great shooters have really mastered all of these different areas. If you desire to be a great shooter; look through this list and figure out which areas you are strong at and which areas you are weak at. After this, it is up to you to spend time working on these different areas. Don't avoid your weaknesses when you go to the gym to do your basketball training. You want to maximize your strengths as a shooter, but you also want to limit your weaknesses. The only way to do that is by spending time working on your weaknesses. If there is one thing that you take away from this article, take this. GREAT SHOOTERS ARE MADE IN THE GYM. 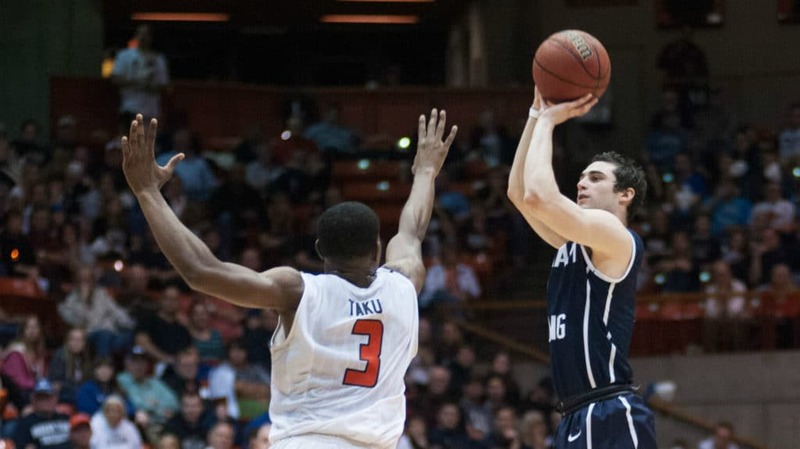 Some shooters are more naturally gifted, but there has never been a great shooter in the history of the game, that hasn't also put a countless number of hours into their shot. Muscle memory is acquired through repetition. In a game when you shoot the ball without thinking about it, you rely on muscle memory. Game speed is determined by how you fast you would shoot the ball in an actual game. You want to practice at game speed so you are prepared for the way you should shoot in a game. Can you explain how to shoot a one motion shot like Stephen Curry, is rhythm created when there’s no pause between raising the ball and the release, and how to correctly use the legs? Could you explain how to shoot a one motion shot like Steph Curry and how to correctly use the legs? Also is rhythm created when there’s no interruption between raising the ball and releasing it? Shooting in one motion is about preparation before the shot. I always try to drill into our kids the ideas of “hips down” on the catch so they are ready to catch and shoot. The same would be true on kids trying to use the dribble to create the shot; sink your “hips down” as you move into your shot to create better rhythm. The other idea of preparation is for kids to use their feet to catch a pass. A quality shot is created by a quality pass, but not every pass is going to hit the shooting the shot pocket. Drill kids to catch an imperfect pass with their feet active rather than leaning their body to catch a pass that is not perfect. This will quicken their shooting time to what is needed vs. quality opponents. To generate game speed on the shot in shooting drills, have kids say to themselves “game speed” as they catch the ball. This way they are thinking about catching and shooting at a faster pace. How do u get confidence in your shot. It is true that players acquire muscle memory through repetitions. However , the brain does not differentiate between correct and incorrect form of the shooting action. This is why letting (young) players shoot from the 3 point arc too soon, is so detrimental to them developing a great shot as the brain is bombarded with incorrect data as they try to compensate for lack of strength and timing. You build up confidence in your shot once you get a good enough where you could pull up and hit 28 out of 30 every practice. great post coach apart from two points i don’t agree on. 2.2.2 i always prefer players to dip the ball off a catch to create a rhythm. 2.3.1 i like player to have a sway in their legs on the shot therefore landing slightly in front of where they took off from. could also mention a slight turn on the feet on the shot. At some point the old school coaching of shooting needs to catch up with how players are shooting in basketball these days. I thank for this article furnished to me. Practice the right way is the most important aspect. Thanks coach I’m a 9th grader that is trying to get better everyday without a gym. Good points David. We at Pro Shot teach the points you mentioned. We also show video PROOF of all we teach.